PE Tarpaulin fabric and finished Tarpaulin, water proof. These are made from High Density Polyethylene fabric and are coated on either side by LDPE in one colour of different colours in the required GSM. The lamination/coating is done by hot extrusion coating method and adhesion and evenness is very good. 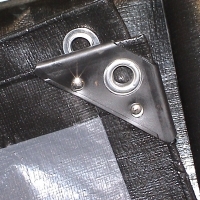 The tarpaulin is made in required sizes (Finished or cut size) and Plastic and Aluminium eyelets (Grommet) are used with rope reinforcement on the edges as desired by the customer from 100 GSM to 400 GSM. Maximum width of one piece fabric is 96". Tarpaulin, size, color is customized. Amerigo offers superior quality tarapaulin & bags that are highly durable and consistent. We are well capable of meeting the desired specification by our clients. We are confident in facilitating the entire range of products in varied sizes, shapes and colours. Manufacturing 100% water proof proof HDPE Tarpaulins for Railway Wagon Covers, Tent Covers, Truck Covers, Utility covers, poultry curtains, Industrial shade tarpaulins & many more usage. 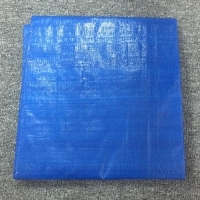 HDPE woven + LDPE laminations,all four side folded hem,eyelet 1 M(3ft) interval, each pc in a polybag with LABEL. Carton or Bale packing. Short on time? Let tarpaulin sellers contact you. Qingdao Yinshan Import And Export Co., Ltd.
We are offering all kind of GSM. Specification: 300*500D/18*9,500D/18*17,1000D/9*9,1000D/20*20 etc Weight: 280g\340g\440g\510g\610g\680g (±20gsm) etc Width: 1.02 - 3.20m. 1. Good surface evenness and peeling strength. Sound appearance and quality. 2. It features light weight, high intensity, bright colour, long working life, good flexibility, sound colour fastness, and anti-flame, anti-cold and anti-age abilities. It is mainly used in sports halls, recreational facilities, carriage, man-made pool, life belt and kayaking. Product model Item 300*500D 18*9 500D(18*17) 1000D(9*9) 1000D 20*20 Unit Reference standard base fabric Polyester weight 280/340 500/580 410/510 680 g/m©÷ GB/T4669-1995 Tensile strength longitude 550 1300 1500 2800 N/5cm GB/T1040.3-2006 latitude 450 1000 1400 2500 N/5cm Tearing strength longitude 80 180 350 200 N/5cm HG/T2581-1994 latitude 100 180 300 200 N/5cm Peeling strength longitude 80 120 80 120 N/5cm GB/T8808-1988 latitude N/5cm Applicable temperature -30-70 Width 1.02-3.20 M.
Tarpaulins W 2 meter X T 0.50mm X L 50 meter. Wrapped in PVC sheet. Pe/PP/PVC coated fabric in stock lots/ rejects/seconds adn pieces. Container loads. Tarpaulin for tent, truck and printing Diff. Width, length and gsm, Standard squermeter up 0.85 euro/m2# And second choise up 0.85 euro/kg. Our tarpaulin made from hdpe weave fabric and coated ldpe on both sides. We supply both in rolls and in sizes. Available mesh:8*8-12*16, weight:80gsm-250gsm, roll width: 1.83-2.5m. 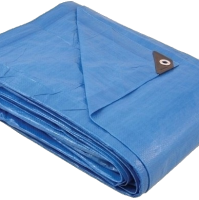 Pe bags, pe tarpaulins, pe pool covers and so on are all in our line, as long as they are made from pe weave fabric. Minimun order 5 tins Small size packed with carton, large size wrapped in cloth. Product information. Manufacturing all sort of polyethylene tarpaulins. Specialize in custom manufacturing special tarps for oems, industrial manufacturers, commercial companies. Materials used are tear resistant, water resistant, light weight 60g/sqm to over 400g/sqm. Scaffolding sheets, house wrap, lumber warp & covers, car shelter, dining canopy, hay cover, green house cover, grain covers, fumigation covers, land fill covers, printable fabrics (banners & billboard), truck tarps, custom car tarps, construction tarps, containment tarps, roof tarps, machinery tarps, sand blasting tarps, sweat lodge tarps, demolition tarps. Markets served include construction industry, chemical plants, offshore oil industry, institutions, hospitals, food manufacturers, trucking industry, seed corn farming, transportation industry & all government industries.